Currently available tenoning machines on the market can only partially fulfill manufacture of windows, and lack flexibility for producing different window types. In the majority of small joinery workshops the business owner has many responsibilities from getting orders, running the workshop for manufacture and to getting paid for their work once completed. 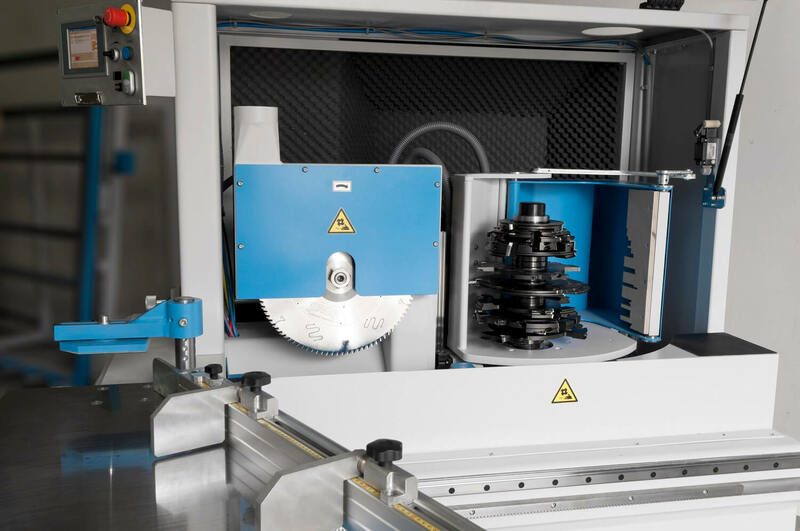 This is a common issue for many joinery workshops and we therefore designed the TEMAC to revolutionise the organisation and manufacturing process of these workshops. 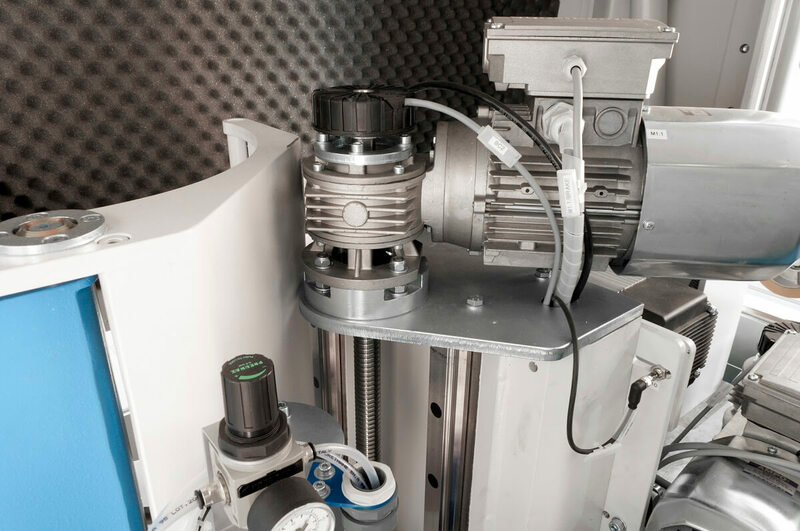 It eliminates much of the downtime necessary for tool changes thanks to its CNC spindle which mounts large stacks of tools and moves up and down to rapidly change between cuts. 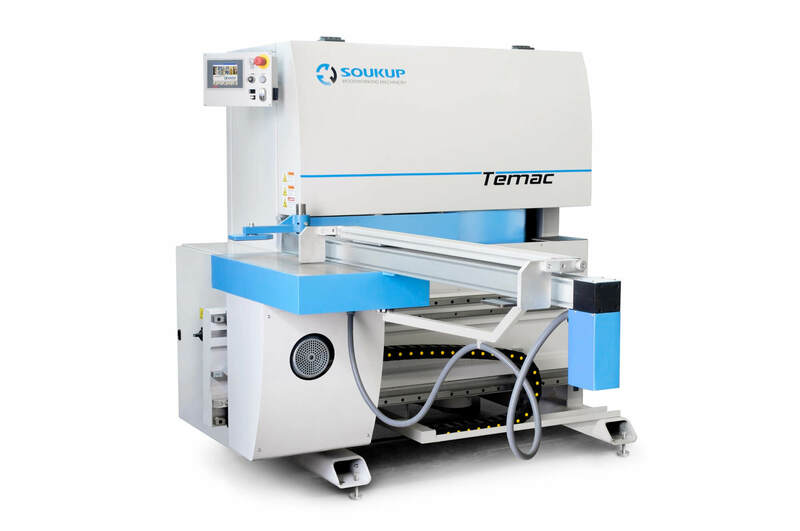 TEMAC E – a heavy tenoner with full electronically controlled set-up of the spindle, cut-off saw and fence. The machine is controlled by an industrial PC that can interface to our WinCreator software. TEMAC M – a heavy tenoner that allows the main tenoning unit to be set to 1 of 3 working heights; it has a manually operated cut-off saw and a tenoning fence with a motorised table. The machine is controlled by an industrial PC that can interface to our WinCreator software. The base of the tenoning machine is constructed from heavy rib structured steel to obtain a solid compact machine which is rigid and highly resistant to heavy loads and stress. 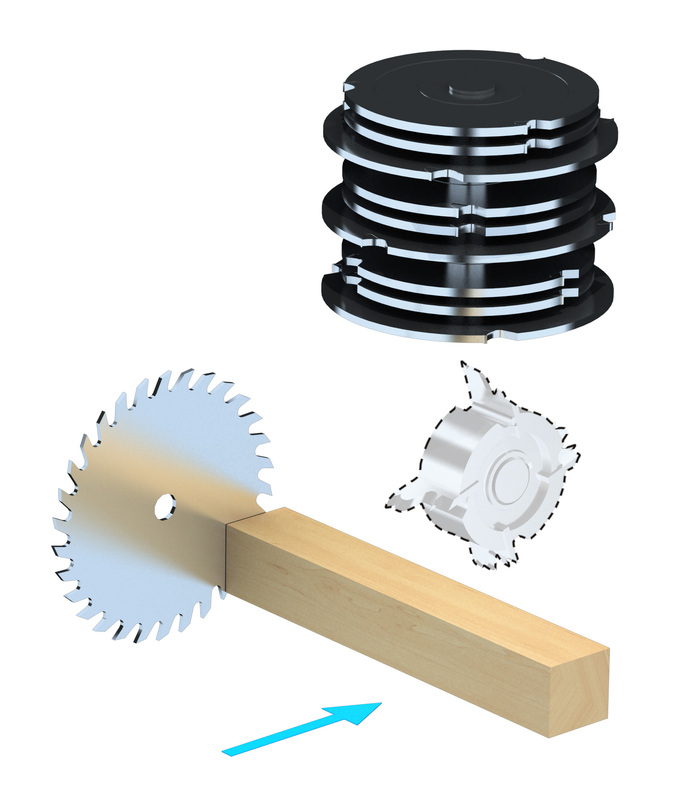 The cut off saw is pneumatically positioned to 1 of 4 positions. The tenoning head is driven by a 10HP motor, the 330 mm long shaft can carry 3 tools which can be set vertically in 3 positions by means of pneumatic pistons sliding on precise linear bearings with the help of a balancing pneumatic piston. The tenoning carriage moves on linear bearings with variable speed controlled by an inverter drive. The tenoning fence can swivel up to 45°, swivel angle is displayed on the monitor. Two horizontal positioning stops are provided with mechanical readout for timbers up to 2900 mm in length. 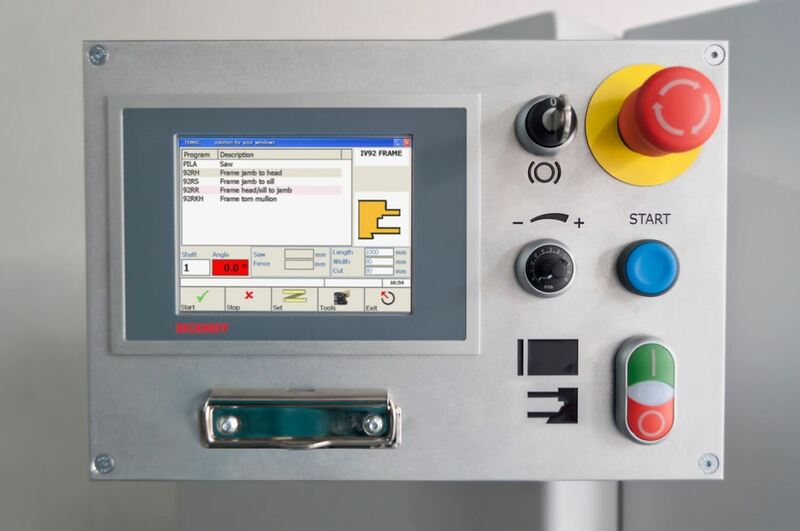 TEMAC is controlled by a BECKOHOFF industrial PC with a 7“ touch screen running a Windows Embedded operating system. The machine can be operated in manual mode or automatically using downloaded data from an offline application such as WinCreator. 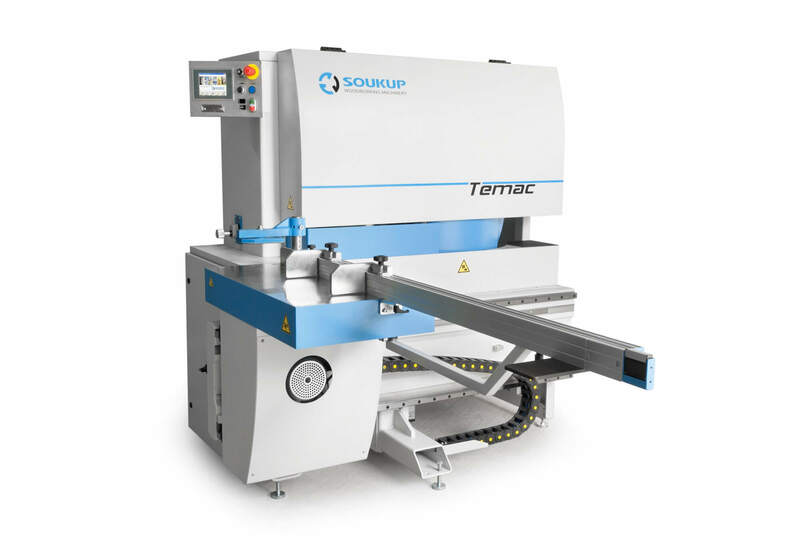 With the TEMAC E the operator is given additional flexibility over the control of the machine with fully programmable positioning of the tenoning head, cut-off saw and tenoning fence.